We’re pleased to provide you with some of the latest Prostate Cancer News You Can Use. Following some noteworthy information that may be of interest to you, the titles of prostate cancer news articles are listed below along with a link to the Us TOO web page that provides access to the full text for each article. Last week the USPSTF (United States Preventive Services Task Force) issued its Final Recommendation Statement on Prostate Cancer Screening with a grade “C” for men aged 55 to 69 years (upgraded from a “D” issued in 2012) and a grade “D” recommendation against PSA-based screening for prostate cancer in men 70 years and older. The statement acknowledged that African American men and men having a father or brother with prostate cancer are more likely to develop prostate cancer, and African American men are more likely to die from prostate cancer. However, the USPSTF is not able to make a separate, specific recommendation on PSA-based screening for these high-risk groups based on the available evidence. In response to the USPSTF Final Recommendation Statement on Prostate Cancer Screening, Us TOO has developed Guidelines for PSA-Based Screening for Prostate Cancer offering additional facts and perspective for a man to consider for an informed discussion with his healthcare providers on the potential value of PSA testing for prostate cancer. Prostate Cancer Pathways for Patients and Caregivers is a new, free educational event and webcast series from Us TOO International. Please join us for our first Pathways event in Seattle on Saturday, June 23. The event will provide a brief overview of men’s wellness and health risks including prostate cancer, followed by medical experts presenting educational content for managing prostate cancer that’s newly diagnosed, recurring, or advanced. Symposium topics will also include genomics along with psychosocial issues related to coping with the challenges of diagnosis and treatment. Get more information and register to attend in person, or watch the online webcast with live audio and video from the event. As you look ahead to online spring shopping for graduations, weddings, and Father’s Day, please consider using AmazonSmile to help raise funds for Us TOO without paying a higher price. AmazonSmile has all of the same merchandise that’s offered on Amazon, and at the same price. But AmazonSmile will donate 0.5 percent of your purchase amount to help Us TOO. There’s no additional cost to you and no limit on the transaction amount. Simply select Us TOO International as your charity of choice. Enjoy the warmer weather and the unofficial start to the summer season with Memorial Day on May 28 as we remember and honor the men and women who died while serving in the U.S. military. 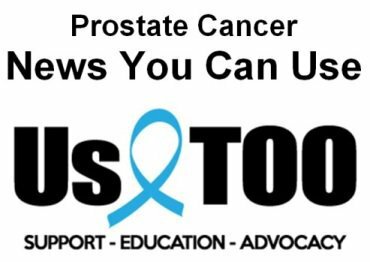 Watch for the June 2018 issue of the Us TOO Hot SHEET newsletter in a few weeks; and let us know how we can help provide you with educational resources, support services and personal connections to others in the prostate cancer community.